Malignant gliomas including glioblastoma multiforme (GBM) are extremely rare in children as compared to the adult population. 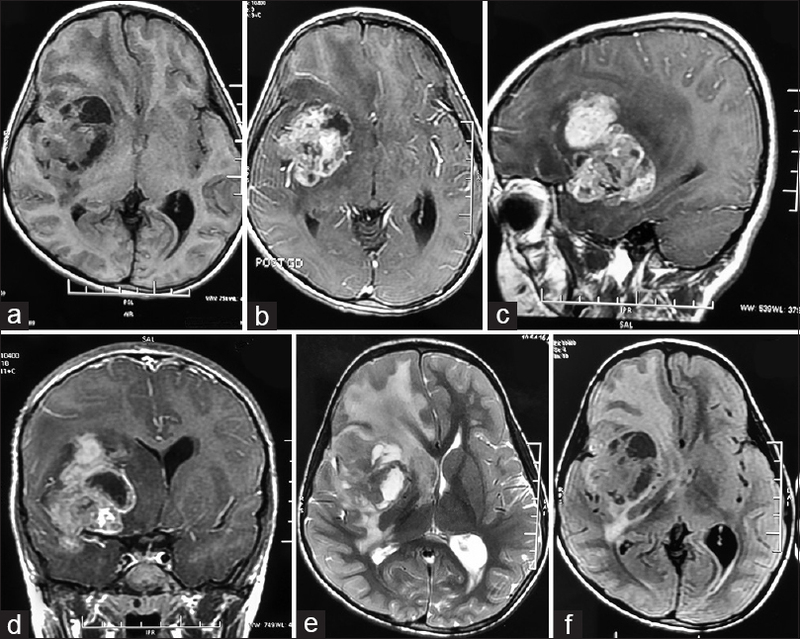 Giant cell glioblastoma (GCG) is a rare subgroup of GBM, which constitutes around 5% of all GBMs and hence immensely uncommon among the pediatric population. Due to rarity of the cases, natural history of the entity is not well understood. It has been hypothesized that GCG has a better outcome and higher survival rates than GBM. However, it does not hold true in our index case, hence making this case unique. An otherwise well, 7-year-old girl presented with generalized seizures, left-sided limb weakness, nausea and vomiting of short duration. Neurological examination revealed the power of 3/5 in both left upper and lower limbs. General and other systemic examinations were unremarkable. Contrast-enhanced magnetic resonance imaging (CEMRI) brain showed a 45 mm ˣ 45 mm ˣ 60 mm lobulated, infiltrating, heterogeneously enhancing solid cystic mass (hypointense on T1, hyperintense on T2, and heterogeneous contrast enhancement of solid component) in the right posterior frontal, anterior temporoparietal lobe, and right basal ganglia with significant perilesional edema causing midline shift [Figure 1]. She underwent right frontotemporal craniotomy and near-total resection of the tumor. Histopathology was suggestive of GBM, giant cell variant, and the WHO Grade IV. Tumor cells were immunopositive for glial fibrillary acidic protein and p53 while negative for isocitrate dehydrogenase-1; MIB-1 labeling index was 45%–50%. Adjuvant concurrent chemoradiation with daily oral temozolomide (TMZ = 75 mg/m2) during radiation therapy followed by six cycles of adjuvant TMZ (150–200 mg/m2, day 1–5; per oral; every 28 days) was planned. A radiation dose of 60 Gy in 30 fractions over 6 weeks by three-dimensional conformal radiotherapy was delivered. After completion of the first cycle of adjuvant TMZ, she suddenly developed upper backache and paraparesis. CEMRI brain and spine were performed which revealed a residual mass in the right temporal lobe (2.1 cm × 1.6 cm × 1.3 cm) [Figure 2] with intradural extramedullary lesion at D3–D4 level causing severe cord compression (2.6 cm × 1.47 cm × 1.05 cm) with fine nodular leptomeningeal enhancement in dorso-lumbar spinal cord, dorsal, and ventral cauda equina nerve roots suggestive of leptomeningeal drop metastases [Figure 3]. She was administered palliative radiotherapy of 20 Gy in five fractions over 1 week to the spinal metastatic site (D2–D5 level) and was started on intrathecal methotrexate (10 mg) weekly. Unfortunately, she succumbed to death after 3 weeks. GCG, defined as glioblastoma with predominance of giant cells, is a very infrequent tumor and is often considered as a variant of GBM, classified as Grade IV tumor as per the WHO classification, although they might be considered as intermediate between Grade III and Grade IV gliomas as they are prognostically better in terms of survival than the Grade IV GBM. Previously termed as monstrocellular tumor due to the large size of its cells, the glial origin of these tumors has now been confirmed on electron microscopy and immunohistochemistry., It usually occurs in adults and rarely presents in the pediatric age group. To the best of our knowledge, since 1952, <100 cases in the pediatric age group have been reported in the literature. GCG predominates subcortically in the temporal and parietal lobes, but they infrequently originate in the cerebellum, the lateral ventricles, the optic chiasm, and the spinal cord. The lesion can be multifocal and spinal leptomeningeal metastases, and extraneural metastases have rarely been reported. Our patient presented with right fronto-temporoparietal mass with the development of spinal and spinal leptomeningeal metastases during adjuvant therapy which is extremely rare in GCG, and no other case has been reported in the literature in this population. GCGs do not differ much in the clinical presentation from the classical GBM, although the duration of symptoms may be short. Similarly, the child in our case presented with symptoms of short duration. GCG is generally well circumscribed and homogeneous but may progress to infiltrative and heterogeneous mass lesion. 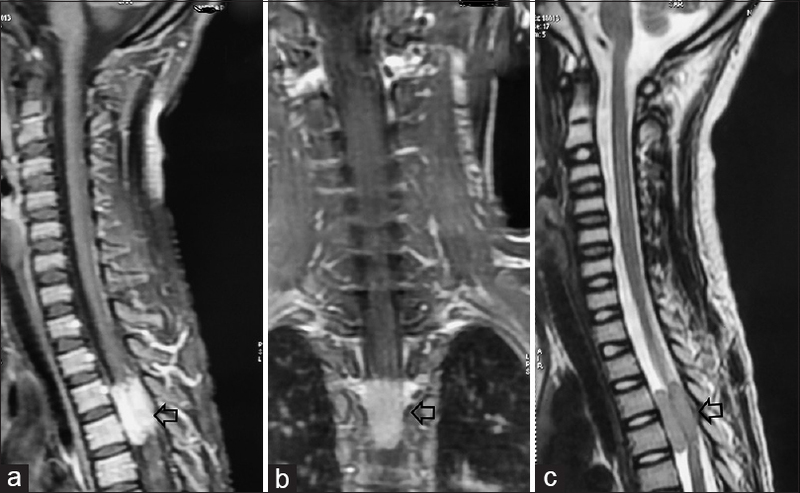 Magnetic resonance (MR) may disclose a contrast-enhancing heterogeneous mass, with solid and cystic areas, hypointense on T1-weighted sequences, hyperintense on T2-weighted sequences surrounded by edema, as in our case. The addition of MR spectroscopy, diffusion-weighted imaging, and perfusion imaging to routine MRI may offer clues that allow for a better differential diagnosis between glioblastomas, the giant cell variety included, and other pathologies. The surgical management is still uncertain due to the rarity of this cases but is known that gross total tumor resection treatment and adjuvant radiotherapy can improve survival rate from 5 to 13 months, similarly to GBM patients. Combination radiation with TMZ represents the optimum adjuvant paradigm to delay tumor progression for patients presenting with GCG. Our patient was treated with near-total tumor resection followed by concurrent chemoradiotherapy with TMZ followed by adjuvant TMZ. Unfortunately, during adjuvant therapy, she developed spinal and spinal leptomeningeal metastases which led to her early demise in spite of salvage therapy with local radiation and intrathecal methotrexate. GCG is very rare in the pediatric age group, but when the diagnosis is confirmed, it offers a better prospect for such patients because of prolonged survival than classic GBM patients. Nevertheless, the clinical presentation and the biological features of the tumor, despite the giant cell morphology, should be well taken into account since a sinister course is also a possibility. Valle-Folgueral JM, Mascarenhas L, Costa JA, Vieira F, Soares-Fernandes J, Beleza P, et al. Giant cell glioblastoma: Review of the literature and illustrated case. Neurocirugia (Astur) 2008;19:343-9. Hadfield MG, Silverberg SG. Light and electron microscopy of giant-cell glioblastoma. Cancer 1972;30:989-96. Kawano H, Kubota T, Sato K, Goya T, Arikawa S, Wakisaka S, et al. Immunohistochemical study of giant cell in glioblastoma. Clin Neuropathol 1995;14:118-23. Kleihues P Cavenee WK eds. World Health Organisation classification of tumours: Pathology and genetics of tumours of the nervous system. Lyon: IARC Press, 2000. p. 40-1. Chang CC, Kuwana N, Ito S, Koike Y, Kitamura H. Spinal leptomeningeal metastases of giant cell glioblastoma associated with subarachnoid haemorrhage: Case report. J Clin Neurosci 2001;8:56-9. Demir MK, Hakan T, Akinci O, Berkman Z. Primary cerebellar glioblastoma multiforme. Diagn Interv Radiol 2005;11:83-6. Oh T, Rutkowski MJ, Safaee M, Sun MZ, Sayegh ET, Bloch O, et al. Survival outcomes of giant cell glioblastoma: Institutional experience in the management of 20 patients. J Clin Neurosci 2014;21:2129-34.